Back from the weeklong hiatus with a review of another modern classic, Quentin Tarantino’s Pulp Fiction! This is one highly rated movie and controversial in some ways because some people don’t see what the fuss is about, others say they like it because they feel like they should and then you get the people who absolutely adore it. You’ve probably guessed already, but we’re in the latter of the categories. The movie chronicles the lives of two mob hit men, a boxer, a gangster's wife, and a pair of diner bandits that intertwine in non linear tales of violence and redemption. Jackson and Travolta are genius together and deliver some of the most quotable lines imaginable. Thurman is an absolute delight to watch and there is a stunning scene in Jack Rabbit Slim’s which is one of the greatest movie moments of all time. If you’re one of those indie people who like film you're going to say you love Pulp Fiction purely because it's so highly regarded. So we actually admire people brave enough to say "no I don't get it." Because we forget film is subjective sometimes. Pulp Fiction may seem like 3 stories that are randomly hashed together in a film to some people. Whereas we think it's a modern classic because the stories are not random at all and the film is not so much about the watch and the briefcase. By definition Pulp Fiction is lurid throw-away stories sold to make money and for cheap entertainment. So in the films case, the drugs, indignities, crime and gore is the type of thing you would find in these types of books but the film is actually so much more than cheap pulp fiction. At multiple times during the film they are all the shepherd, the weak and the evil. The characters trade positions and the moral is that no one is any one of these things solely. At different points in the movie, all the characters trade roles. Notably Honey Bunny and Pumpkin are very much tyrants at the beginning, yet as a result of a string of choices, they are in a very different position by the end of the movie. Therefore the stories are not random but illustrate the point that we could all end up at the mercy of someone else and conversely, someone could end up at the mercy of us. Now that may all seem like drama school rubbish to you, but the witty script, magnificent camera work, superb soundtrack, iconic acting and Quentin's trademarks are very hard to discredit. 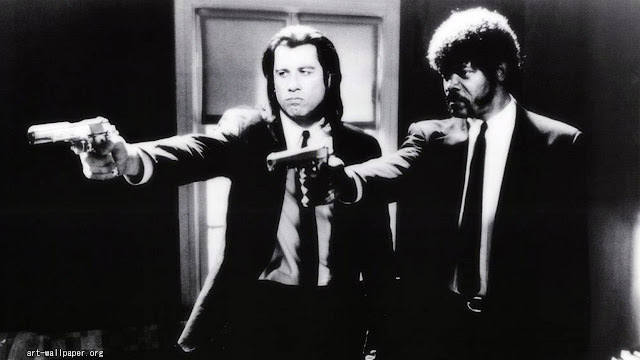 Pretty certain most of you will have watched this masterpiece, but if not: go for it, Pulp Fiction is not just a modern classic, it's a classic. Have your say: favourite Pulp Fiction character? You know where to comment! Come and see how THOUSAND of people like YOU are making a LIVING online and are fulfilling their dreams right NOW.